With only 8 luxuriously furnished tents, Selous Impala Camp on the Rufiji River offers you a genuine Tanzania safari experience. Selous Impala Camp is set amidst Borassus aethiopum palms and Tamarind trees and provides superb comfort, wonderful African wildlife and dining under the stars besides the rippling Rufiji River. The managers of Selous Impala Camp are experienced hosts who will ensure warm hospitality and delicious food. Below this Tanzania lodge on the Rufiji River is an attractive sitting area just above the river, where campfires are lit every night so that the visitor can enjoy the sound of the animals and birds in the evening, and hear the crickets sing as the waters flow by. Nearby is a sheltered, crystal clear blue swimming pool, great for ending a day of game viewing, or to enjoy a sundowner and bathe in the evening. At this Tanzania lodge, game drives can be quite exciting. The reserve contains about one third of all the African Hunting Dogs in the world. Here they have boundless woodlands and savannah in which to roam. Near Selous Impala Camp one can see several prides of Lions. Guests on a Tanzania safari can also spot Leopard, Cheetah, Buffalo Elephant, Hippo, the normal herbivores and a wonderful variety of birds - over 300 species - all of which makes this a nature's paradise. Selous Impala Camp in Tanzania is surrounded by several lakes, which are attractive and offer interesting bird viewing. 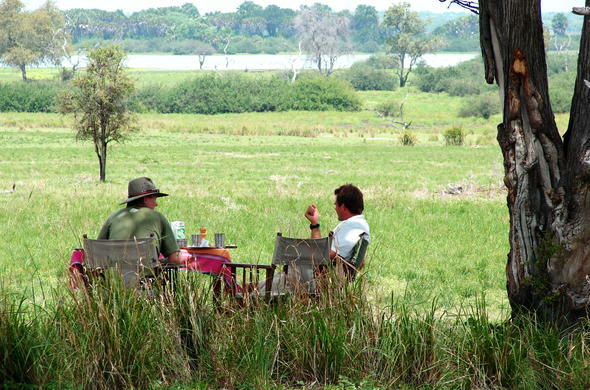 Guided walking safaris are also offered as well as fly-camping on request. Selous Impala Camp offers game drives with a guide and driver. The area boasts Lion, Elephant, Leopard, Cheetah, Buffalo and a variety of birds. Selous Impala Camp in Selous Game Reserve, Tanzania, is overlooking the Rufiji River, where guests dine and relax in the day, enjoying a book from the library and a drink from the bar.